When it comes to health, there is no compromise. Enjoy healthy cooking with Miele's steam oven. Featuring the PureSteam technology from the Miele freestanding steam oven, enjoy the ease of achieving precision steam cooking and healthy savoury food today! Purchase DG 6010 Steam Oven (Obsidian Black) at a special price of $1,688 (U.P. $1,988). 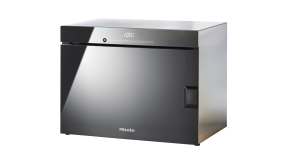 In-Store Exclusive Promotion: For customers who already own a Miele freestanding oven, refer a friend and be rewarded with 2 packs of descaling tablets (worth S$70). This promotional campaign is effective from 18 February to 30 April 2019.